Over the past nine years, Jennifer Hill has built Support Women Artists Now Day Connecticut into one of the most successful SWAN festivals in the world. The award-winning singer-songwriter and pianist truly embodies the SWAN spirit through her tireless efforts to support other women artists. SWAN Day CT 2016 will be a multi-disciplinary event featuring 17 female-fronted bands performing on two stages, burlesque stars, a runway fashion show, visual artists, craft vendors, and food and drink. It will be held on Saturday, March 5th starting at 5:30 pm, at Trinity on Main in downtown New Britain. Get more info on the SWAN Day CT Facebook Page. 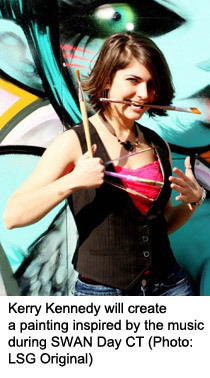 Jennifer Hill, who also performs as the Murderous Chanteuse ("killing songs since the day she was born"), was motivated to start SWAN Day CT because she had experienced a lot of sexism in the male-dominated world of rock music. At the most basic level, she would show up for performances and male producers and technicians would address questions to men in her band instead of her. She knew that other women were experiencing similar issues, and when she saw the announcement of the first SWAN Day back in 2008, she leapt at the chance to create an event where women could work together and find ways to support each other. "That first year, I had lots of positive press but not lots of turnout," says Jennifer Hill. "Now, promoters come to find the best musicians." The event draws audiences of 300-500 people, cultivated with the help of extensive press coverage including TV and radio interviews done by Hill and her "flock of SWANs," the artists themselves. As its reputation for excellence has grown, SWAN Day CT has become an important stepping stone for artists in her region and a rare opportunity for artists of all disciplines to come together and find new artistic collaborators. The larger community's acceptance of SWAN Day has also evolved over the show's nine years. Hill is a staunch advocate for all kinds of women artists, and since the first SWAN Day, burlesque performers have been part of the show, even though that sometimes caused friction in the larger community. Hill explains, "People used to tell me burlesque wasn't artistic. I had threats of arrest. I was charged extra for liability insurance. I had to prove that burlesque was art, despite the fact that our performers are well known in New York City and New Orleans. We are more accepted now, after so many years. We were covered by an upscale magazine for Westport, CT — an article about us was next to one about yachts." Increasing the visibility and opportunities for the women who perform at SWAN Day is a core part of Hill's passion for SWAN Day. "I do everything I can to promote and help them," she says. Her investment in women artists doesn't end when SWAN day is over; "Once you're a SWAN, you're always a SWAN — as long as you want to be! I feel a sense of responsibility for the things that happen with them — and it makes me feel good." The success of SWAN Day CT spreads into the wider community throughout the year, as the proceeds from ticket sales and vendor tables at SWAN Day CT are often given back to local women artists. Hill has given grants for everything from keeping an art space open, to buying a printer, to boosting a post on Facebook. 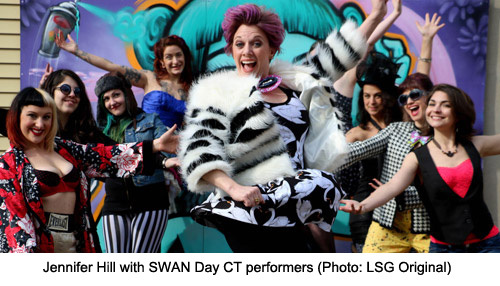 SWAN Day CT is a great example of the power of women artists helping and believing in each other. 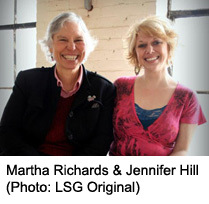 Hill says that she has been encouraged by the support she has received from WomenArts Executive Director, Martha Richards. "Martha has always been our cheerleader. . . she never acted like my show wasn't worthy, or wasn't art." Over the past nine years, Hill has done her best to pass that acceptance and support on to hundreds of artists in her region and to encourage them to support each other. The effects of the friendships and creative partnerships that she has helped to build through SWAN Day CT will ripple through her community for years to come. Congratulations to Jennifer Hill and to all the women and men who have worked so hard to make SWAN Day CT an event that really rocks! Long before SWAN Day was born, the legendary jazz singer and producer Nicki Mathis formed her own Afrikan Amerikan Jazz band and in 1987 she founded The Many Colors of a W*O*M*A*N Jazz Festivals to showcase jazzwomen and their contributions to African American's indigenous creative art form, jazz. She will be performing with SWAN Day CT for the fourth time this year. Based in Hartford, CT, The Many Colors of a W*O*M*A*N is one of the longest-running festivals of jazz women in the world. You can watch the 2014 festival on YouTube. 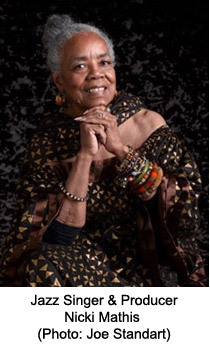 SWAN Day CT is honored that Nicki Mathis and her Afrikan Amerikan Jazz Quintet will be kicking off this year's show on the Theatre stage, and WomenArts salutes Nicki Mathis for her decades of trailblazing work in support of women in jazz.